Hey, all. 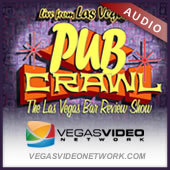 Dave asked if he could let Pub Crawl folks know about he and Alicia’s new audio-only podcast called LV Locals. So. . .here’s DAVE! Alicia eats the worm. David almost throws up. Together the Ivy’s scour the Strip and uncover which casino bars give you the best bang for your buck. As we wrap up we learn why post-handcuff sweet talk does not work. David and Alicia hop a ride on the monorail for this week’s Pub Crawl Adventure. They experience overpriced drinks, some of the best burgers in Vegas and send a big f*ck you to PETA along the way. Hey Bartender throws us a curve ball with a viewer question that takes us out of usual Vegas cocoon and proves challenging to answer. David and Alicia invent a delicious Cocktail of the Week by accident. Our downtown Pub Crawl Adventure is inspired by a viewer email. Alicia leaves David speechless and the live studio audience calls shenanigans!